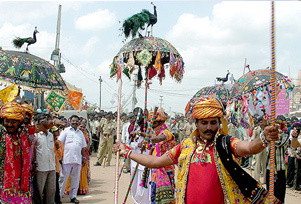 People who wish to peek into the lifestyle of the Gujarat people should be a part of the Tarnetar festival. The festival spans for three days and takes place in August or September as per the Georgian calendar. As per the historians, the festival is organized to celebrate Draupadi's (In epic Mahabharata, "fire born" daughter of Drupada) swayamwar (An ancient practice of choosing a husband, from among a list of suitors), which was won by Arjuna (In epic Mahabharata, 3rd of the Pandava brothers) by piercing the eye of rotting fish by looking at its reflection on the water. The festival takes place to commemorate archery performance of Arjun. The fair is not only a celebration of their union, but also that of other young men and women who look for and find love and togetherness here. The venue on the ground is the temple of Triniteshwar Mahadev, the same place where Draupadi's swayamwar took place. Most interesting part of the festival is that Tarnetar Fair is a unique matchmaking fair. All the prospective grooms are seen holding a colourful umbrella and girls are seen wearing red zimi (ladies dress) swirling around to dance. Girl or boy indicates their interest by approaching each other, leaving rest to elders for other matrimonial details. Visitors who are least interested in matrimonial associations can visit stalls that exhibit beautiful art and craft work of Gujarat. For the children, there are many game counters, swings and many other recreational activities like merry-go-round rides, photographers' stalls, magic shows and tattoo artists stalls. Multiple types of dance forms are performed during the festival and most famous amongst them is dandiya raas. All the men and women strike small lacquered batons to a beat that gets faster till it finally breaks in a frenzied. Rahado, a circular folk dance is performed by the Rabari women of nearby Zalawad. With time, footfall in the fair is increasing; approximately 50,000 people attended the festival in the year 2014.